February 26 is the anniversary of the death of Richard Jordan Gatling (1903). In one of history’s great oxymoronic moments, well-intentioned doctor and inventor Richard Jordan Gatling devised his hand-cranked killing machine as a militaristic solution to the inconceivable loss of life in the American Civil War. 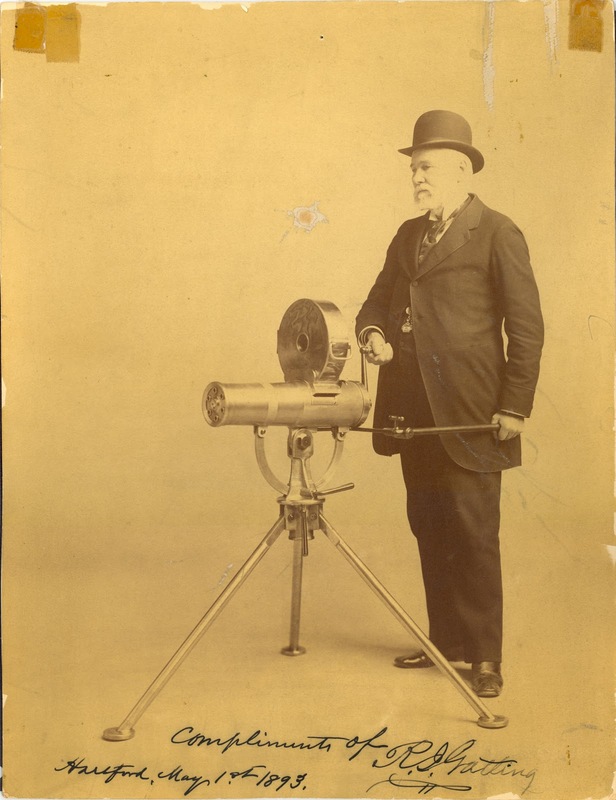 Gatling was a Southerner born in North Carolina in 1818 to a farmer and inventor. He initially followed in his father’s footsteps and developed a seed planter, grain drill, and shovel plow before earning a medical degree in 1850. Gatling moved north to Indianapolis to practice medicine but never strayed far from inventing. It was while watching returning Civil War soldiers die more often from battlefield illnesses than gunshot wounds that he decided to work on a hyper-efficient weapon. Gatling was not so much a pacifist as a pragmatist. He did not seek to end wars, only to reduce the number of soldiers it took to fight them. Gatling wrote that “It occurred to me that if I could invent a machine—a gun—which could by its rapidity of fire, enable one man to do as much battle duty as a hundred, that it would, to a large extent supersede the necessity of large armies, and consequently, exposure to battle and disease [would] be greatly diminished.” Sadly, this proved not to be the case, and Gatling had succeeded only in creating a precursor to the modern machine gun, which has been responsible for countless deaths in the past century (see also tommy gun and AK-47). Individual reloading during the Civil War was a time-consuming process. The Gatling gun featured multiple rifle barrels mounted around a crankable shaft, so one gunner could fire as many as 400 rounds per minute and pick off countless unlucky single-shooters at a range of up to twenty football fields. There were many eponymous machine guns invented during the Civil War (e.g., the Gorgas, the Ripley, the Claxon, and the Williams), some of which also featured rotators and multiple barrels to avoid overheating, but only the Gatling had a fool-proof, gravity-fed reloader that meant it could be operated by anyone. Though no one speaks of true Gatling guns being used anymore, the doctor’s legacy has been preserved in a shortened slang form first used by the criminal underworld at the turn of the twentieth century and more recently by urban rappers—the gat.